Golden Casket is celebrating its 60th birthday by sponsoring an ‘Oor Wullie’ sculpture to raise money for sick kids. Thoughtful staff at the Greenock confectionery company are marking the firm’s diamond anniversary by supporting the Oor Wullie’s BIG Bucket Trail. It’s billed as Scotland’s first national art trail and will see over 200 Wullie statues go on display before the sculptures are auctioned off to raise funds for children’s hospital charities. Golden Casket is sponsoring a unique Millions sweets-inspired Oor Wullie, which will be in Glasgow’s Argyle Street from June 17 until the end of August. They will also donate a mini version of the sculpture to a local school or community centre. 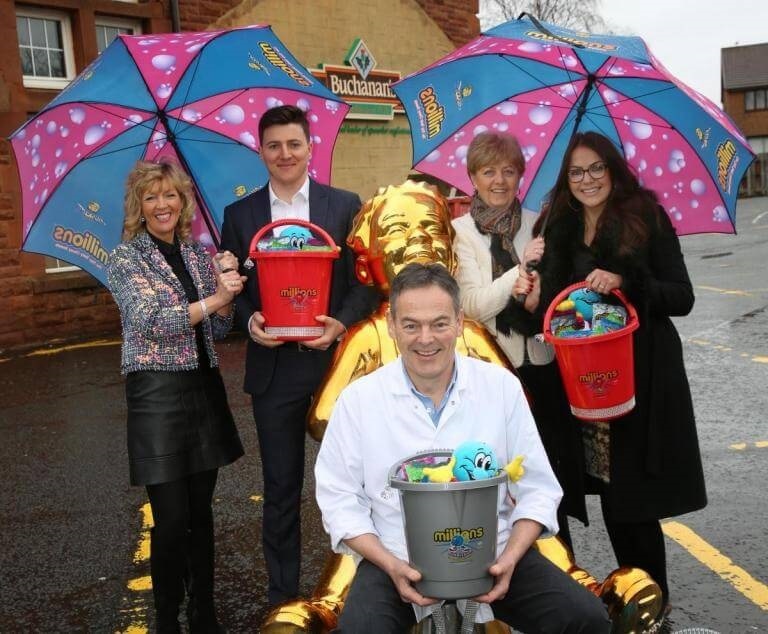 Sandra Fisher, sales and marketing director for the Golden Casket Group, says they are proud to raise money for the Glasgow Children’s Hospital Charity, Edinburgh Children’s Hospital Charity and the ARCHIE Foundation. “This is a fantastic charity event to raise money for sick children, and we are delighted to be part of this, especially in our 60th year in business. “Obviously with Millions, it’s children who we sell to so this is an excellent way of giving something back for our 60th anniversary. Kirsten Sinclair, chief operating officer at Glasgow Children’s Hospital Charity, praised Golden Casket for their support. “We’re delighted that Golden Casket is involved with Oor Wullie’s BIG Bucket Trail by sponsoring their very own sculpture. Our Italian Importer Vittorio and his son Simone paid us a visit from Bazzano, Bologna this week! 20th February 2017 – Scotland is enjoying a population boom – in jelly babies.